Explore the Dolomites and enjoy breath-taking landscapes and delicacies of the local cuisine. 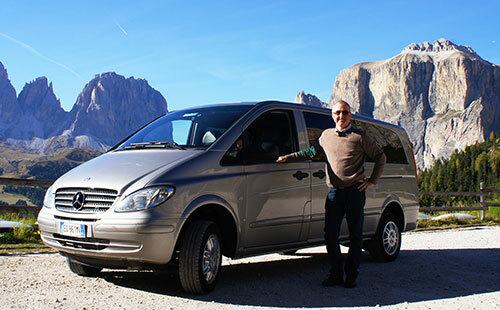 A company with over 10 years of experience in Car Rental with Chauffeurs in Cortina d’Ampezzo and the Dolomites, and an extensive network of local collaborators who, like us, offer high-quality services to clients. We are based in Cortina d’Ampezzo, but we can take our clients to the Dolomites, Italy and across land borders. We are operational during all seasons of the year. We have modern, comfortable, air-conditioned vehicles with leather interiors, all wheel drive, equipped to take on mountain roads safely, even during the winter season. Our rates, approved by the Chamber of Commerce and the Municipality of Cortina d’Ampezzo, are highly competitive and include taxes, tolls, and access to traffic restricted areas (ZTL). With a booking request from our website or directly to our mobile phone number, you can rest assured that you will be followed by professionals in the field who are polite, cordial, prepared and helpful.